ROME (Reuters) - Canadian Prime Minister Justin Trudeau on Monday urged Pope Francis to visit Canada to apologize to indigenous peoples for the Catholic Church's treatment of aboriginal children in schools it ran there. The commission made 94 recommendations, including that the pope issue a formal apology in Canada to survivors and their descendents for the Church's "role in the spiritual, cultural, emotional, physical, and sexual abuse" of the children. 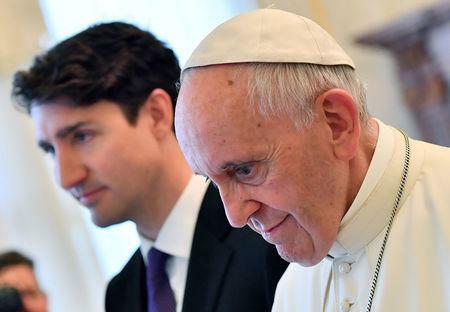 Trudeau said that in their private talks, the pope "reminded me that his entire life has been dedicated to supporting marginalized people in the world, fighting for them, and that he looks forward to working with me and with the Canadian bishops to figure out a path forward together". At last week's Group of Seven (G7) summit in Sicily, Trump refused to back a landmark international agreement reached in Paris in 2015 to reduce global warming. Trudeau, who is Catholic, said he had "a deeply personal and wide-ranging, thoughtful conversation with the leader of my own faith".